It's been a while since I posted but been a bit busy since my holiday. Anyway here is an easy to make birthday card for you. I needed a last minute card so this fitted the bill as it's just a question of cutting it out and finding a nice backing paper. This was for a boy so nothing flowery on this ocasion. Thank you for sharing your wonderful talent and free SVG files. I look forward to seeing and using your creations. Very pretty, I can't wait to play with it! Thank you. "Simply" great, cut and prepare paper while cutting, wonderful. Thank you Shirley, you always come up with the goods! Thank you! This is so versatile and a great design to have on hand. Cute file, Shirley. Thanks for sharing. Thanks ever so much - greatly appreciated. The file looks great! Thanks for sharing it with all of us. Thanks so much Shirley - I hope you had a great holiday! Thanks for sharing this Shirley ! Thanks for sharing this Shirley !! A great design Shirley. Thanks so much. Oh my, I love stars! Thanks for adding them to your design. Just what I was looking for! Thanks for sharing! Perfect birthday card, thanks again for all the files!! Thank you I'm always looking for boy designs much appreciated. Thank you! Super cute card! Thank you. Awesome card for my son in laws birthday. Thank you for the file, using it for granddaughters BD card. Thank you very much for this beautiful card. The link is working fine, I have just downloaded it. 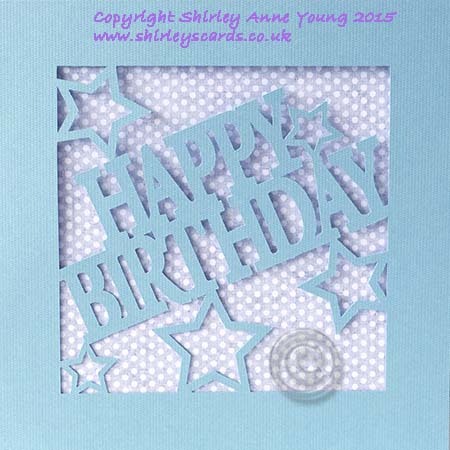 Thank you very much for this beautiful birthday card, Shirley. Vielen Dank, sehr schöne Datei!